Camcorder sales may be down, but Panasonic is confident is can ride the decline thanks to a new focus on high definition technology. The company said in its presentation this afternoon that camcorder sales have fallen 11% in the last year, making life difficult for top five camcorder makers in Europe - Sony, JVC, Panasonic, Canon and Samsung. However Panasonic plans to combat the decline - and grow its market share (its currently number three in terms of units sold) by introducing professional level features in its consumer cameras. Panasonic said the key features were optical image stabilisation to reduce unwanted camera shake, 3CCD image sensors to increase picture detail and colour fidelity, plus new Leica Dicomar lenses. 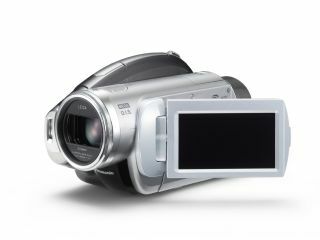 Other key features for 2007 include the company's new AVCHD technology - which it has developed in conjunction with Sony - and 5.1-channel sound when video recording. It also detailed improvements in batter technology that enable camcorders to see exactly how much recording time they had left in minutes. Until now Panasonic's camcorders have used a 3-step battery indicator which hasn't been very precise. Panasonic demonstrated the benefits of its 3CCD approach by comparing its new DX1 camcorder with the single CMOS Sony UX1. Although both camcorders use the same AVCHD codec, the advantage of Panasonic's 3CCD image sensor was - quite literally - clear. However the demo was perhaps a little unfair to Sony as it has yet to reveal which features its 2007 AVCHD camcorder line-up will have. For the second point of its magic triangle Panasonics showed of its SD-10, an SD-based camcorder that is sand and splash-proof, making it ideal for use on the beach. The third point was taken up by the SDR-H20 and SDR-H250, two hybrid models that combine SD card memory slots with 30GB hard disk drives.